The perfect theme to learn about weather, clothing, and nature with your group! (Open Game-Tree full of leaves) Display four trees (without leaves) Decorate each tree to represent the different seasons. (Open weather-seasons) Print and display the illustrations which represent the four seasons. Hang various objects which represent the seasons such as raindrops, a sun, lightning, clouds, and snowflakes. Hang different sizes of transparent balloons using invisible thread. The pictures may be used as a memory game or to spark a conversation with your group. Use them to decorate your daycare or a thematic corner. 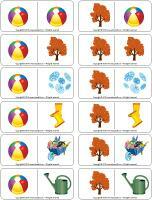 (Open picture game-Four seasons) Print, laminate, and store in a "Ziploc" bag or in your thematic bin. 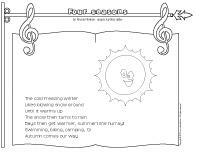 (Open activity sheets-Four seasons) Activity sheets are suggested for each theme. Print and follow instructions. Bin containing a variety of figurines. Blocks of all kinds and complimentary material children may use for various constructions. They can make a tent to protect themselves from the sun, a cottage for summer vacation, an igloo, etc. Cover the floor of your construction area with cotton batting to represent snow, blue plastic to represent water, or pieces of fabric in various colors. Make clouds using cardboard, gray paint, paintbrushes, silver glitter, and cotton balls. Make umbrellas using colourful cardboard and various pre-cut shapes. Use dark construction paper and chalk to create a snowstorm or winter scene. Make sunglasses using empty toilet paper rolls and cellophane. Rain... makes mud! Why not paint with mud? Simply add sand to poster paint and you are set! Acetate paper (or Mac-Tac) or CDs may be used to make beautiful suncatchers. Simply decorate them as you wish and hang them in windows. Yellow, orange, and red construction paper to make a giant sun... a great project for a group! Make sun hats out of construction paper and decorative accessories. Use an empty paper towel roll to make a rainstick. Cut coffee filters to make snowflakes. Coloring pages which represent the different seasons. Spring-Autumn: rain boots, rain hat, raincoat, warm sweater, small mittens, nylon pants, umbrella, etc. Summer: bathing suit, towel, shorts, t-shirt, sandals, sun hat, baseball cap, etc. Winter: snowsuit, mittens, scarf, boots, etc. Organize your corner to make it look like a barbecue. Isn't it fun to use the barbecue during summer? Set up an apple orchard area. Talk about apples. Memory game with educatall.com illustrations representing the four seasons. Ascending and descending order game involving different sizes of mittens. White and gray modeling dough to make clouds, yellow and orange for suns, etc. Provide cookie cutters. Various board games children enjoy. Books about the weather and seasons. CD player and headphones children may use to listen to sounds of nature. Dotted sun, raindrop, and cloud models children can trace. Games using educatall.com word flashcards. Activity sheets related to the theme. Activities involving the letter "S" like "Season" or the number "4"
Set up an obstacle course. At the end, trace each child's silhouette on a sheet of paper or the pavement if you are outdoors. Use an inverted umbrella as a basket and throw balls of paper in it. Make bubbles and watch them fly away in the wind. Water table: provide perforated containers children can use to make rain. Container filled with ice or snow. Water table and droppers, turkey basters, colanders, etc. Container filled with dried leaves. Container filled with pinecones and pine needles. Bake cupcakes and add rainbow chocolate chips. Enjoy a cup of hot cocoa. Observe a variety of thermometers. In which area of the daycare is the temperature highest? Lowest? Deposit a variety of objects on a piece of black construction paper. Leave it outside, in the sun, for a few hours. What happens? What do plants need to grow? This theme is perfect for a gardening activity. Deposit plants in various locations to see which ones will grow best. Observe ice as it melts in the sun. Ask parents to provide a picture of their child enjoying an outdoor activity. 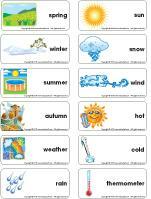 Have the child describe the activity, identify the season, the weather, the scenery, etc. During circle time, ask children if they have ever been to the beach. Ask them to tell you about their trip. Create your own imaginary trip to the beach by tapping into children's imagination. Stand up and choose a spot to set up your beach towel. Throw a beach ball around, go swimming, sunbathe, etc. You will need a few empty bottles. Fill each bottle with items which can be associated to the four seasons: pebbles, seashells, water, colourful water, sand, leaves, mud, grass, items which represent different celebrations such as Christmas, Halloween... Use hot glue to secure the bottle caps. When you are done, encourage children to give the bottles to younger children as a gift. They will be so proud to share their creations! Prepare manipulation bins which represent each of the four seasons. A bin filled with snow (artificial snow, cotton balls, pieces of tissue paper, etc. ), a bin filled with leaves (leaves you found outdoors, paper or fabric leaves, etc. ), a bin filled with sand, and a bin filled with water are perfect examples. (Open die-Four seasons) Use a cardboard box to make a cube. Glue the illustrations on the sides of the box. Children roll the die and must act out the sport which is shown. Encourage them to name the season associated to each sport. Play lively music and invite children to dance barefoot, with shoes, with rain boots, with winter boots, etc. Children sit in a circle. Place clothing for each of the seasons in the centre of the circle. Children pass an unbreakable mirror around the circle to the sound of music. When the music stops, the child holding the mirror must get dressed with clothing which is appropriate for a specific season. Invite the child to look at himself in the mirror when he is done. (Open lacing-Four seasons) Print, cut out, and laminate the shapes. Use a hole punch to make holes around the contour of the shapes. Children thread a shoelace or a string through the holes. Excellent activity for fine motor skills! Stand in a circle and deposit a hula hoop in the centre of the circle. The hula hoop represents Mr. Sun. Children take turns creating a dance step. The other children repeat the dance step. Make bubbles outdoors on a very cold winter day. You will be able to observe the bubbles as they freeze. They will even break like ice! Make a gigantic pile of leaves and invite children to jump in the pile over and over again! This is a very simple activity but children will have so much fun! On a beautiful summer day, prepare several different workshops involving water for your group. Some ideas are a sponge bin, a bin with bubble bath, a colourful bin, a bin filled with very cold water, a bin filled with warm water, etc. Ask parents to send rain boots and an umbrella for their child. Enjoy a walk in the rain with your group. Deposit a pile of very light objects (such as feathers) on a table. Blow on the pile (like wind) to push the objects as far as possible. (Open poster-Seasonal wall) Print and display. Ask parents to provide a few pictures which were taken outdoors. Create your own seasonal wall. Divide the wall into four equal sections. 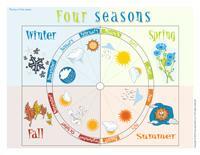 Add a poster to clearly identify each of the seasons. Add the pictures to the correct section. (Open memo-Seasonal clothing) Print for parents. This memo is a great reminder of the importance of sending adequate clothing for their child, depending on the season. (Open magnifying glass game-Four seasons) Print and laminate the board game and the cards. Cut them out and store them in a box or in a Ziploc bag. Children pick a card and search for the item on the board game, using a magnifying glass. Once they have found the item, they deposit it in the correct square, on the board game. Hang four different clotheslines within the daycare. Each clothesline represents a specific season. Fill four baskets with clothing items from every season. Children must sort the clothing and hang it on the correct clothesline. (Open game-I am learning to dress myself) Children dress the dolls for each season. 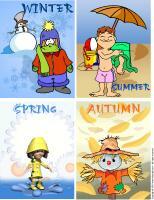 (Open poster-Seasons) Print the four illustrations which represent the seasons. Print the small cards and cut them out. Children must associate the cards to the correct season and deposit them in the squares. (Open bingo-Weather) Print and laminate. Play bingo with your group. (Open game-Seasonal clothing) Print and laminate the posters and the cards. Children associate the clothing items to the correct seasons. (Open educ-association-Four seasons) Print. Follow the instructions to arrange the game in a file folder. Children must associate the illustrations. Once they have found the correct associations, they must place the cards in the correct squares using Velcro or adhesive putty. (Open die-Weather) Children sit in a circle. Deposit clothing items for each season in the centre of the circle. Write the name of each child on a piece of paper, fold the papers, and drop them into a bowl. Pick two names. Roll the die. Children must race to dress up with clothing which is appropriate for the weather shown on the die. (Open dominoes-Four seasons) Print, cut out, and laminate the dominoes. Show children how to play. Let children play at the water table. Add a few ice cubes and encourage children to notice the temperature change. Fill rubber gloves with hot water and tie a knot. Deposit them in a container filled with cold water. Select poster paint colors which represent the seasons. Mix them together and observe. Fill ice cube trays with water and add a few drops of food coloring to each section. Place them in the freezer. When they are almost frozen, add Popsicle sticks. Let children paint with the ice cubes. Watch the colors change. Divide your group into four small teams. Each group is given a season and a seasonal recipe to prepare. You may also choose to prepare each recipe with the entire group. You may prepare one recipe per day. Prepare four special lunches. Each one can represent a different season. Autumn: decorate the table using a variety of decorative squashes and serve spaghetti squash. Divide the daycare into four distinct areas. Prepare seasonal crafts to decorate each area. Summer: use rocks, branches, dried flowers, etc. Autumn: use leaves, peduncles, apple seeds, etc. Winter: use artificial snow, cotton balls, snowflakes, etc. Spring: use tulips, a cardboard sun, buds, etc. Purchase a few decorative gourds or squashes. Let children dip them in poster paint and roll them on a large sheet of white paper. Help them notice how each type of squash leaves a different type of print on the paper. Glue several autumn leaves on a sheet of white paper. Dip old toothbrushes in poster paint (to which you have added a small quantity of water) and let children project paint onto the leaves. Once dry, remove the leaves and admire! Go for a nature walk with your group and collect branches, pinecones, leaves, acorns, etc. Let children use their findings for a painting activity. Children glue mints on a piece of dark construction paper to represent a snowstorm. Trace the outline of a drawing using white glue. Sprinkle with fine sand. Shake off any excess sand. You will have a beautiful three-dimensional drawing. Cut pictures out of magazines, newspapers, etc. Divide a large piece of white cardboard into four sections. Ask children to glue the pictures in the correct sections. Make holes at the top of the milk carton and thread string through the holes to hang it from a branch. Cut a large door out of one side of the milk carton so the birds can enter the bird feeder. Decorate and fill with birdseed. Cut the milk carton in two. Keep the bottom only. Decorate it and add birdseed. Make holes on either side and thread string through the holes to hang it in a tree. Have children paint the egg carton cups using different springtime colors. Let dry. Cut each cup individually. Insert a pipe cleaner into each cup to represent the stem. Push them into a Styrofoam block or display in a vase. (Open creative coloring-Four seasons) Print for each child. Children draw the things they like best about each season. (Open coloring pages theme-Four seasons) Print and color. Days then get warmer, summertime hurray!